For the obligatory carrot cake for my birthday this year, I decided to combine elements of Carrot Cake II with Carrot Cake I. These alterations included using half granulated sugar and half light brown sugar and adding more spices (cinnamon, nutmeg, and cloves). I used my preferred cream cheese frosting recipe, but flirted with the idea of using browned butter and maple syrup (instead of vanilla). I slightly reduced the amount of carrots, because I think I used too much previously (seems like 1 cup of grated carrots should be about 130 g). AND, I avoided the almost-disaster from last year when the cake stuck to the pans by lining them with parchment paper. I made the recipe in three cake pans (each pan took about ~475 g of batter) because three layer cakes look better and it means more icing. There is plenty of icing in the recipe to frost all of the layers, and I had extra leftover to accompany the first slices. The cake is quite light and moist with nice added flavor from the spices and brown sugar. I’ll have to try a few more recipe variations to see which changes are keepers. 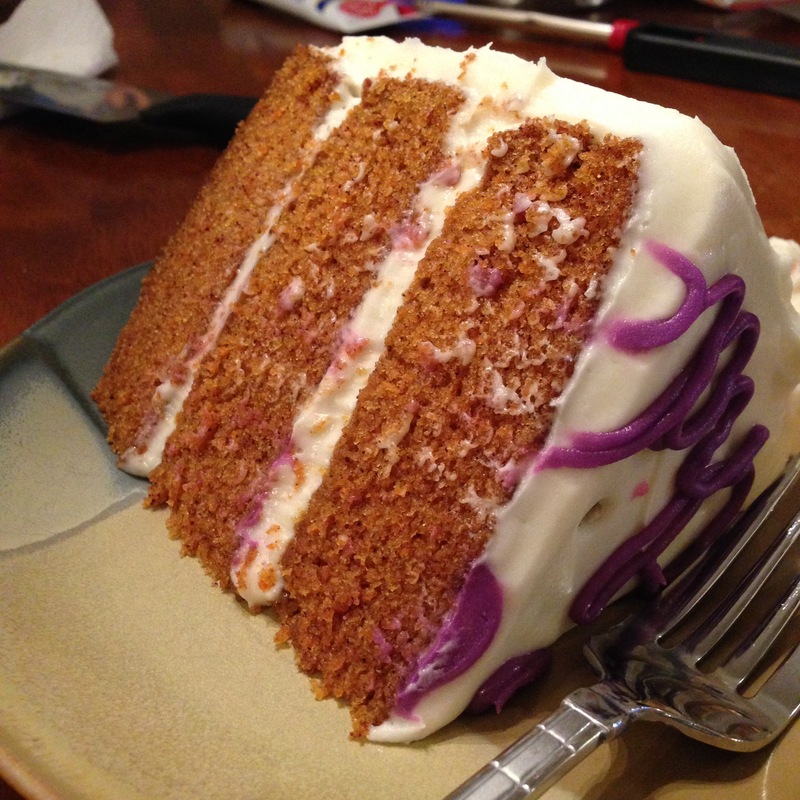 For some reason, I felt like there could have been more flavor in the cake, which might have been because of the reduction in carrots. 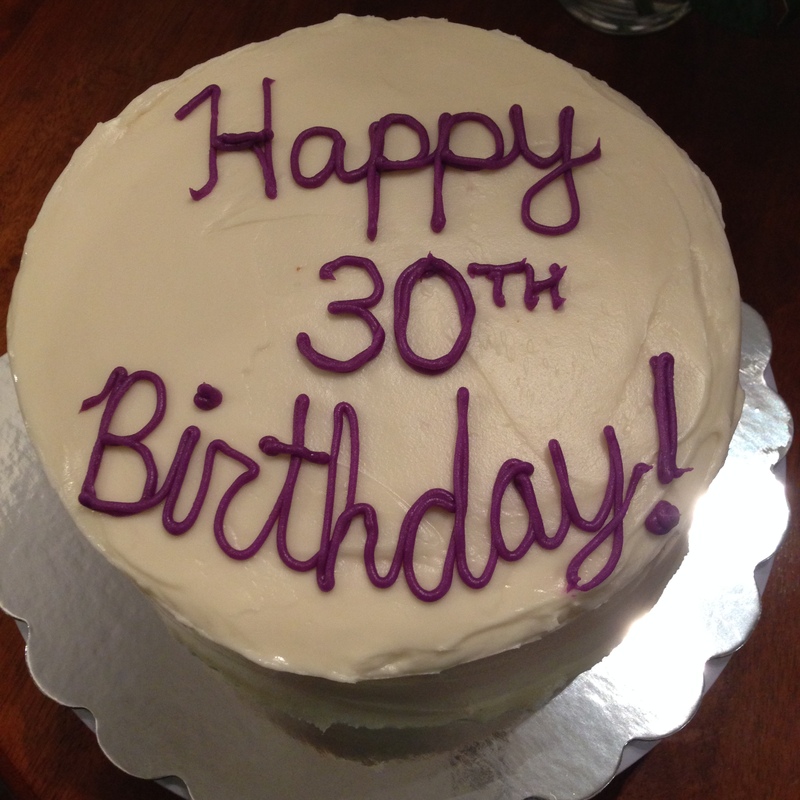 All in all, it was a great birthday cake, and I’m already looking forward to next year’s! For the cake: Heat oven to 350 degrees. Butter and flour three 8″ cake pans. Line with parchment paper, then butter and flour the parchment paper. Combine all ingredients in a food processor until well-mixed and carrots are well-integrated. Split cake batter evenly between the two pans. Bake for 25 minutes or until cake tester comes out clean.